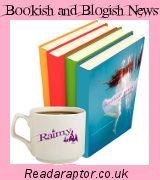 Bookish and Blogish news is my weekly wrap up of the news around the YA industry and my blog this week. This includes cover reveals, new book announcements, new author sign ups, book trailers, blog tours and more. I hope you enjoy! Quercus Books have signed Cat Clarke for two more books. The first will be called Safe and Sound and will be a psychological thriller which tells the story of a girl who’s sister returns home following an abduction earlier in life. The name of the second book is currently unknown. Cat has a book out in April this year called A Kiss In The Dark and Safe and Sound will be published in Spring of 2015. I have absolutely loved all of Cat’s books so far so this news makes me ridiculously happy, go Cat! Penguin released this amazingly cool and spooky trailer for Gretel and The Dark to coincide with the publishing date of the book this week and its made me want to read it all the more. I will have to get to my copy soon, but maybe not late at night! And just cos I wanted something to contrast completely with that Gretel and The Dark Trailer, here’s a crazy trailer to welcome you to the jungle. This has got me even more intrigued about Grasshopper Jungle, which is actually next on my list of books to read, lets hope its as fun as the trailer suggests! Thanks for sharing Electric Monkey! Cannot wait for the new Cat Clarkes! Yay for new Cat books! Can’t wait. Exciting about the new Cat Clarkes!